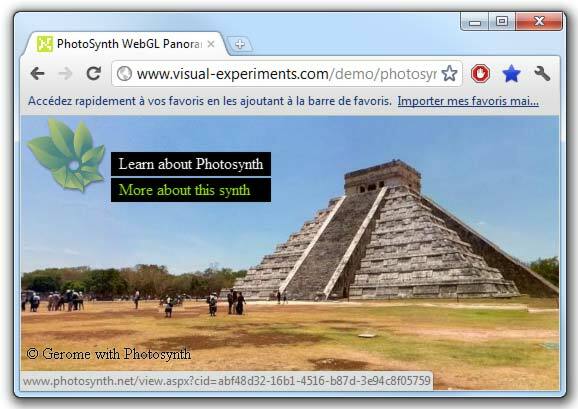 I’ve updated my PhotoSynth Downloader/Parser to be able to process Synth and Panorama as well. The network part of my PhotoSynth downloader was really ugly: I’ve rewrote it from scratch using libcurl. This version is really much faster and doesn’t crash anymore. But I’m a bit concerned about releasing the binary/source code. Allowing the download of a panorama created with an iPhone doesn’t bother me but it’s really different with gigapixel panorama (and my downloader can download both). My implementation is very strait-forward: my PhotoSynthHDDownloader creates 6 jpg from a panorama url. The 6 faces of the cube are downloaded at full resolution. This solution is suitable for panorama created with an iPhone (low res) but not acceptable for gigapixel panorama (you need progressive download/display). I’m using Three.js as WebGL engine and I’d like to implement a megatexture solution to display very large panorama (I’ve found a very impressive working implementation and played with it: it is working with Google Chrome / Firefox 10). To be able to handle panorama as well, my Google Chrome extension needs to use megatexture and it would be really more efficient if Microsoft could add the missing cors header to allow WebGL cross-origin (even only for photosynth.net). And as they’ve just moved their data to Windows Azure, I guess that it may be easier to add this header . Otherwise I’ll have to use my special trick to bypass webgl same-origin-policy restriction.